LONDON, England (CNN) -- The English club football season closes this weekend with one of the sport's oldest contests: the FA Cup final. 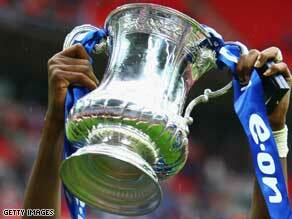 The FA Cup, which was founded in 1871, is the oldest domestic association cup competition. Currently held by Premier League Portsmouth, this year's final sees Guus Hiddink's Chelsea face Everton at London's Wembley Stadium. The Football Association (FA) Cup is the world's longest-running cup competition. First contested in 1871, the competition sees teams from all professional leagues and the top amateur leagues compete in a knock-out format for the coveted prize. About 90,000 people are expected at Wembley for this year's final -- a massive change from the 2000 strong crowd which watched the first final 127 years ago. Although only contested by English and Welsh clubs, the FA Cup is hugely popular all over the world. According to the FA, the estimated global viewing audience for the 2005 final at the Millennium Stadium, where Arsenal beat Manchester United on penalties, was 484 million. That figure dwarfs the audiences for many other major sporting events. An FA spokesman told CNN the competition had such a strong following due to its history and the "unpredictable" nature of cup football that meant tiny amateur teams could get a shot at the big time. "The FA Cup is the oldest football competition in the world and one that the association is very proud of. It is seen all over the world by TV viewers and is a showpiece event of the English domestic season. "It retains a magical quality throughout the early stages because it is extremely unpredictable. Last season only one of the four semi-final teams was from the top flight." This year the FA Cup had a record number of 762 entries, the spokesman added. The current holder of the FA Cup is Portsmouth, however, the 2009 final is to be contested by Chelsea and Everton at Wembley Stadium this weekend. Alongside the FA Cup, the entire United Kingdom and Ireland region has a wealth of long-standing domestic cup football competitions. The Scottish Cup was formed in 1874, while the Welsh Cup has been running since 1877, and the Northern Ireland-based Irish Cup has been in action since 1881. The Dutch Cup involves all of the teams from the top two divisions in the Netherlands, as well as the top four sides from each of the six third-tier competitions, and further teams from the fourth tier. This year's KNVB Cup was won by Heerenveen, who defeated FC Twente on penalties to win the final. What domestic cup competition is your favorite and why? Tell us in the Sound Off box below. Barcelona were deserving winners of this year's Copa del Rey, claiming the cup for the 25th time to establish themselves as the most successful club in the competition's history. First contested in 1902, the Copa del Rey has become one of the most-respected domestic cup competitions in the world, partly for the length of time it has run, but also due to the strength of the Spanish league. The Norwegian Football Cup, or simply "Cupen", is the premier knock-out competition in Norway, contested between April and November. Valerenga, a team from the city of Oslo is the current holder of the cup. Both Valerenga and Rosenberg have won the Cupen twice in the last decade. First played in 1909, the Hungarian Cup, or Magyar Kupa in Hungarian, is contested by all of the professional teams in the country, as well as a number of amateur teams who must qualify through local competitions. Budapest Honved FC recently won the 2008/2009 edition of the Hungarian Cup. Open to all five levels of affiliated amateur and professional teams in the United States, the annual U.S. Open Cup is the oldest competition in U.S. soccer. This year marks the 96th time the tournament has been held, and Major League Soccer side D.C. United will be trying to defend the cup after winning it in 2008. This season saw one of most memorable runs in the long history of the Coupe de France, as second-tier team En Avant de Guingamp marched to the title ahead of more fancied Ligue 1 opposition. It was only the second time that the cup has been won by a team outside of the top division. Top-flight side Olympique de Marseille have won the cup a record 10 times. The oldest football competition in Japan, the Emperor's Cup is an extremely important piece of silverware in the country as it offers entry to the Asian Champions League (ACL). Gamba Osaka won the last final, which is always contested on New Year's Day. This competition has been dominated by the impressive Al-Ahly club, which has won the cup 35 times. The current holder is fellow Egyptian Premier League team Haras el Hodood -- and they have now qualified for the Egyptian Super Cup match, which will see them take on league winners Al-Ahly. Like the FA Cup, the major cup competition in Portuguese football will hold its final this weekend. FC Porto and Pacos Ferreira will contest the match -- which offers a Europa League place to the winner -- provided they haven't already qualified for the Champions League. Benfica have the best record in the competition, having won 27 times. Although it was established before the Serie A league competition, the Coppa Italia doesn't seem to hold the same appeal to fans -- as many matches are played before much smaller crowds than Serie A games. The best peformers have been AS Roma and Juventus, who have both won the cup nine times. Lazio is the current holder. "New Zealand" and "prestigious football competitions" aren't two terms you'd normally squeeze into the same sentence. However, the Chatham Cup, established in 1923, is among some of the oldest cup competitions in the world. It is contested by traditional club sides in the South Pacific country, rather than the franchise teams in the national league. The current holder of the Chatham Cup is East Coast Bays.